But a new picture is now emerging in myriad projects around the world. Their core value is stewardship, not extraction. Growth, in this story, means soils, biodiversity and watersheds getting healthier, and communities more resilient. Care for place – not money, and not GDP – is the ultimate measure of value. 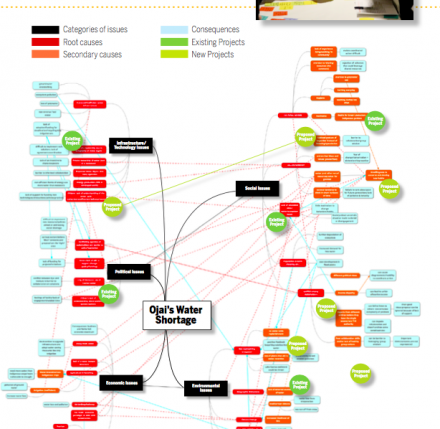 In California, Terry Irwin and Gideon Kossoff are engaging with a water crisis that will not have a single solution. They use Transition Design (above) to coordinate multiple interventions over short and long horizons of time. 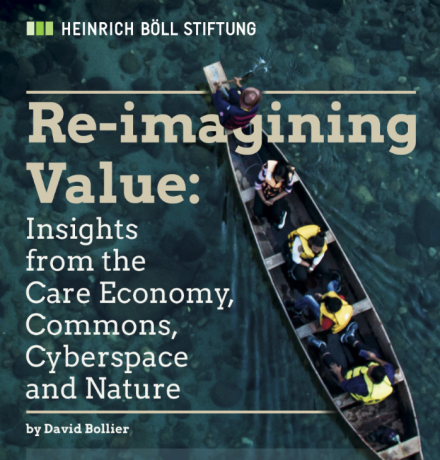 by different actors and stakeholders: new technologies, institutional and legislative reforms, new ﬁnancial mechanisms, platforms for long-term environmental stewardship. These seedlings are inspiring to behold – but something more is needed to effect the system change we yearn for: a shared purpose, that diverse groups people can relate to, and support, whatever their other differences. 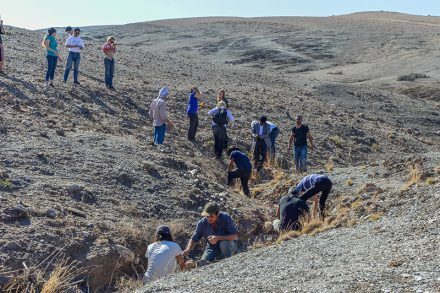 In the Altiplano of Spain (above) John Liu is leading the first in a series called Ecological Restoration Camp to restore a severely damaged ecosystem in a damaged dry landscape. A diverse community of researchers, landscape designers, farmers, gardeners, engineers and other professionals are restoring the landscape in ways that regain environmental, social and economic value. Bioregions are not just geographical places; they also embody the inter-connection of our minds, and and nature’s, at a molecular, atomic and hormonal level. A bioregion repairs the unity of mind and world, that has been fractured by modernity. A bioregion, in this sense, is literally and etymologically a ‘life-place’, in Robert Thayer’s words, that is definable by natural rather than political or economic boundaries. Its geographic, climatic, hydrological, and ecological qualities – its metabolism – can be the basis for meaning and identity because they are unique. Growth, in a bioregion, is redefined as improvements to the health and carrying capacity of the land, and the resilience of communities. And because its core value is stewardship, not extraction, a bioregion frames the next economy, not the dying one we have now. A bioregion is shaped by characteristics of the natural environment rather than by man-made divisions: Its geology; topography; climate; soils; hydrology and watersheds; agriculture; biodiversity, flora and fauna, vegetation. Ecological systems are unique to each place, and the same goes for the social assets of a bioregion – individuals, groups, networks, and cultures. A bioregion is not a generic template. It meaning deepens during the discovery and mapping of its social and cultural assets. Bioregional knowledge is socially created, local, experienced directly, and embodied. 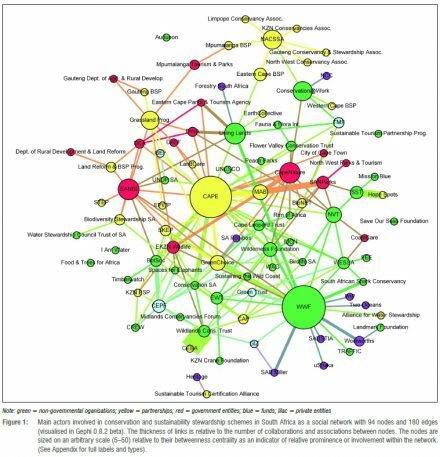 The embodied nature of land-based knowledge has shaped recent trends in agricultural knowledge and information systems (AKIS) and agricultural innovation system (AIS). LUMA-Arles is a new contemporary art center and campus founded by Maja Hoffman in the Camargue region in southern France. 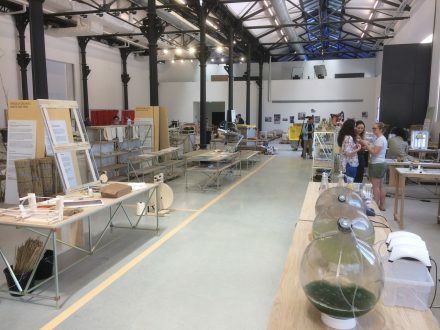 In Atelier-Luma (above) designers and researchers, curated by Jan Boelen, working with local stakeholders, are exploring new opportunities for Arles and its bioregion. Projects range from the development of algae-based polymers to the use of biodiversity telematics in citizen science and ecological restoration. With a focus on systems change towards sustainability, agricultural ‘extension’ gives priority to participatory discovery, and experiential learning. Social network analysis is also being used to identify key players who can act as critical injection points in the system. A lot of information about a bioregion’s social, cultural and ecological assets can be discovered in overlooked archives and databases. This information is often dry, de-contextualised lists; wonders can appear when artists or actors are allowed access to these resources. Cities are part of the bioregional story, too. They do not exist separately from the land they are built on, and the resources that feed them. A growing number of blogs and platforms encourage a city’s citizens, and its managers, to re-connect in practical ways with the soils, trees, animals, landscapes, energy systems, water and energy systems on which all life, including ours, depends. Seen in the context of its bioregion, a city is about more than architecture and hard (or electronically networked) infrastructure. In cities, it turns out, a wide variety of emergent ecosystems are developing before our eyes. Some of these can be tiny. Biotopes – the smallest unit to be studied in a landscape, including urban ones – include hedges, roadside verges, drainage ditches, small brooks, bogs, marl pits, natural ponds, thickets, prehistoric barrows and other small uncultivated areas. A new priority in the urban landscape itself is to connect these patches together. 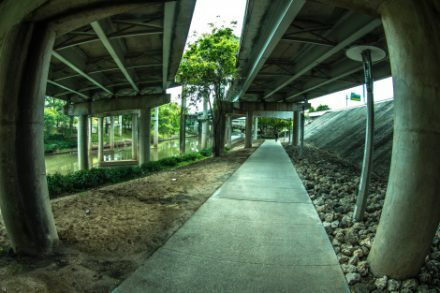 Green-blue corridors can transform a mosaic of discrete parts into a place-wide ecology. Attention is also turning to metabolic cycles and the ‘capillarity’ of the metropolis wherein rivers and biocorridors are given pride of place. In New York, researchers are mapping its microbiomes. Inspired by the power of the small to enrich the big, 45,000 vacant lots in Allegheny County, Pittsburgh, are being brought back to life, one by one. In that same don’t-knock-patches spirit, @ioby enlivens neighbourhoods block by block. The bioregional approach enriches economic relocalisation efforts that measure where resources come from; identify ‘leakages’ in the local economy; and explore how these leaks could be plugged by locally available resources. One such ‘leak’ is food. Up to 25 percent of the ecological impact of a rich city can be attributed to its food systems. Similar constraints apply to flows of textiles and clothing. The relocalisation of regional food and fibre systems entails transition from a linear to an holistic, social and ecological approach to agriculture. A farmer, in this story, is far more than a producer of agricultural commodities for the city. She is also the steward of an agro-ecological system in which water, soil, landscape, energy, biodiversity, are a interdependent. 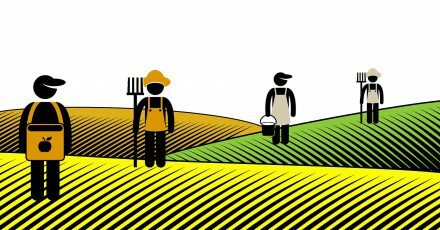 With ‘social farming‘ and ‘care farming’ the direct participation of citizens in farm-based activities needs also to be enabled by service platforms. Ecological agriculture begins with an analysis of the carrying capacity of the land, and then growing crops, and rearing animals, in ways that regenerate the soils and biodiversity. In the transition to High Nature Value Farming, each location has to be understood and designed as an ecosystem within a bioregional web of natural systems. This approach is more knowledge-intensive than the industrial model it’s replacing – and the scale and complexity of biodiversity data can be formidable. An ecology metrics list on Github lists more than three thousand terms – from molecular phylogenetics to microrefugia, from myrmecology to ecophisiology. A collaborative approach, and multiple skills in new combinations, are needed to cope with that complexity. Open information information channels for the sharing of resources are a challenging design priority. At a bioregional scale, ecological agriculture also includes the development of new forms of land tenure, new distribution models, processing facilities, financing, and training. 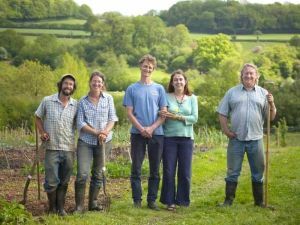 In England, the Ecological Land Co-operative is creating smallholding clusters. The ELC buys agricultural land and seeks planning permission for new residential smallholdings as well as providing shared infrastructure. These ‘starter farms’ (above) are then leased to smallholders – at well below market rates – on a long and secure leasehold. Industrial or ‘production’ approaches to the land treat agriculture as an engineering challenge. But nature is calibrated to a multitude of different time scales – in cycles that are shaped by the unique qualities of infintely diverse locations. The tempo of bioregional work needs to be guided by eigenzeiten – the embedded times specific to an organism or system. Ecological restoration in a bioregion, and ecological agriculture, are of course supported, to a degree, by technology. The Climate Tech Wiki, for example, lists hundreds of mitigation and adaptation technologies – from advanced paper recycling, to urban forestry. Stewarding a bioregion involves measuring the carrying capacity of the land and watersheds; putting systems in place to monitor progress; and feeding back results. Diverse arrays of networked microprocessors are being developed to this end. In the Camargue bioregion of France Olivier Rovellotti , a biodiversity telematics designer, develops platforms such as Ecobalade (above) that equip citizens with the means to understand and monitor biodiversity assets on the spot and in real-time. Under the umbrella of ‘precision agriculture‘, developers hope that sensor applications might be also useful for farmers; applications range from thermal imagery and current soil moisture content, to soil surface porosity and water absorption capacity. Some optimists also believe that regenerative agriculture and-robotics can benefit each other. 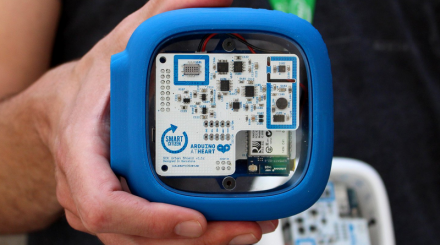 At @IAAC in Barcelona, their Smart Citizen platform (see photo above) enables citizens to monitor levels of air or noise pollution around their home or business. The system connects data, people and knowledge based on their location; the device’s low power consumption allows it to be placed on balconies and windowsills where power is provided by a solar panel or battery. We can also measure oil contamination in our local river with a smartphone. Thousands of people are monitoring the air they breathe using Air Quality Eggs. 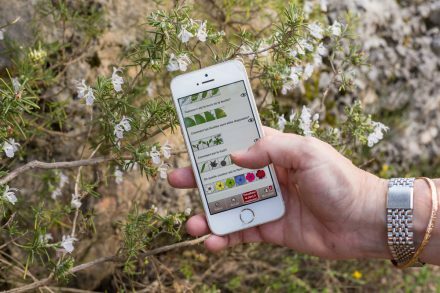 Monitoring – with or without tech – is most meaningful when it enables practical steps to be taken in ecological restoration at a bioregional scale. In Bangalore, the revival of Jakkur lake began with a mapping platform developed by Aajwanti (an ex- Quicksand intern) working with @ZenRainman. How will these skills be learned, or accessed? If the health of people, and the places where we live, are connected, what kinds of business can help them thrive together? 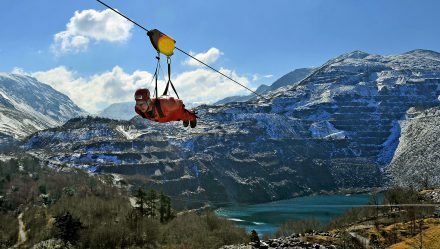 With its own unique assets, North West Wales has the potential to lead the world as a living laboratory for innovation where adventure sport, tourism, and wellness meet. To realise this potential, and turn ideas into new livelihoods and enterprise, the region’s assets need to be combined and connected in new ways. Pontio Innovation is leading on this work. Universities across the north-western United States have developed a Curriculum for the Bioregion that transforms the ways in which tomorrow’s professionals will approach place-based development. A impressive archive of completed projects is evidence that these are not just academic activities. Multidisciplinary teams have evaluated water quality data as indicators of the health of an ecosystem; mapped stream channels in a local watershed; learned about the geology, hydrology, soils, and slope stability of a local town; analysed the environmental costs of metal mining; studied how indigenous peoples used to inhabit their region – and discussed how best to integrate this legacy into today’s new models of development. in Europe, an online course on Land Stewardship:was produced by the LandLife EU programme. During the course, students presented case studies of land stewardship; designed a stewardship agreement; analysed collaboration methods and communication experiences; and explored funding opportunities for land stewardship. If ecological restoration is indeed the “great work” of our time’ – then we need training centres in every bioregion. For this writer, the Nordic system of Folk High Schools has tremendous potential. Maps – in whatever medium they are made, or experienced – need to represent the ways a bioregion’s social and ecological systems interact with each other. In the past, nature conservation was preooccupied by the impact of habitat destruction on individual species. Today, there is increasing recognition that species interactions may be even more important. 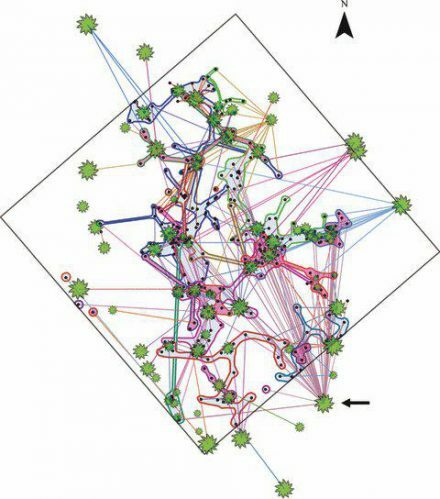 As Jane Memmott explains, all organisms are linked to at least one other species in a variety of critical ways – for example, as predators or prey, or as pollinators or seed dispersers – with the result that each species is embedded in a complex network of interactions (see below). Mapping exercises can reveal gaps. When researchers at the Stockholm Resilience Centre studied a wetland management network crossing all 26 municipalities of the city, it was found (see below) to be fragmented not just ecologically, but administratively, too. Role models and case studies are always important. 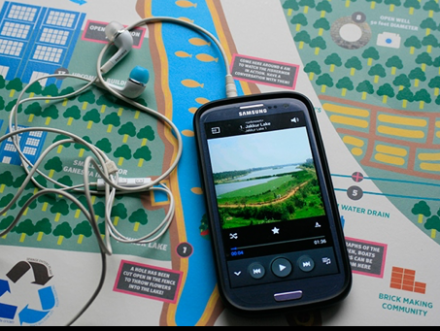 ‘Mapping’ therefore includes multiple ways to collect and tell stories from other places – and other times – in ways that are easy to find, and share. In this ongoing search for new and better ways of knowing – and being – we have huge amounts to learn from non-literate and indigenous cultures whose experience of the world is more direct than our own. Bringing a bioregion to life means connecting with living systems emotionally, and not just rationally. 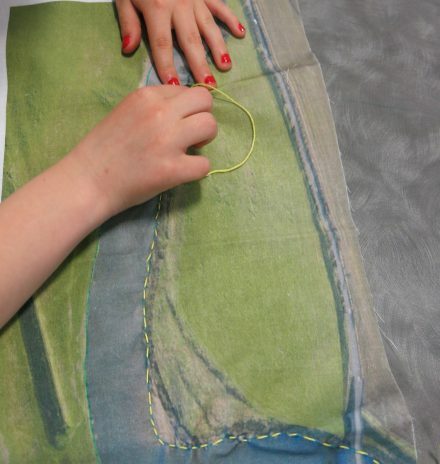 Art can make us curious about “what we’re inside of” (Nora Bateson) and tweak our interest in “the pattern which connects” (Gregory Bateson). Art can allow us to understand complex interdependences, and enhance our capacity to understand processes and system conditions. The ancient metaphorical power inherent in path walking, and path making, frame a project in Scotland called Cateran’s Common Wealth. Clare Cooper curates arts and cultural activities that connect together cultural, social and ecological assets of ‘Big Tree Countrry’;. Deirdre Nelson for example (above) makes handheld stories that weave words and wool, that value knitting and narration as ways of living. Art can provoke encounter, engagement and conversation. Art can trigger attentiveness to living systems, and foster a sense of obligation towards future generations. Art can make us aware of the power of small actions to transform the bigger picture. A growing biocultural education movement links nature and culture as a way of promoting learning about and respect for both, as well as the intimate linkages between them. Many human and technical resources – skills, workshops, machines – are scattered around – but not known about. 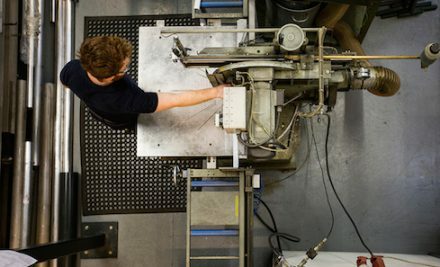 MakeWorks, in Scotland, are changing that. They describe themselves (see below) as ‘factory finders’. Farm Hack, in the United States are a community for open source farm innovation. Members of the network share tips on adapting machinery via hackathons and open-hacking camps. A purely transactional maker economy, based only on selling things, is unlikely to be sustainable in the longer term. If it’s just about the thing, someone will soon find a way to source a similar thing, but cheaper. The French cooperative L’Atelier Paysan therefore trains farmers to design their own machines and buildings adapted to the unique needs of each small farm ecology. Social practices, more than technical platforms on their own, are the cornerstone of bioregional governance. Paying attention to the process by which groups work together is just as important as deciding what needs to be done — perhaps more. It’s not enough to simply to proclaim the moral superiority of sharing, for example, and expect everyone to fall in line. Tough questions must be confronted, and not brushed under the carpet. Among these: How to define, map and name the resources to be shared; determining who is entitled to what; designing rules and sanctions; designing how to make the rules. Dealing with difference involves a lot of consensus building, collective participation, and transparent decision making. New ways of ‘doing’ politics are needed that are shaped by the ways people live now – not the other way round. A wide variety of collaborative services, policies and infrastructures is emerging in support of food co-ops, collective kitchens and dining rooms, community gardens, cooperative distribution platforms, seed banks, hothouses, nurseries, and other enhancements of community food systems. Nurturing these kinds of social practice is a ‘soft’ activity – but no less demanding for that. It involves politics, governance, communications, training, empowerment – and, in particular, the ability to help people with different agendas, from different backgrounds. work together. Thus stated, it lies well outside the comfort zone of most design professionals. But it’s not a matter or either social or technical innovation – we need both. Besides, examples of such new approaches already exist in other domains. The free software movement, for example, has evolved a flexible and effective culture of cooperation. Bioregionalism is appearing with growing frequency in public discourse in European policy and among professional networks (if not always under the same name). A tolerance for acronyms and buzzwords is demanded of the bioregional explorer, but with a bit of digging she too will discover such gems as: IALE (European Association for Landscape Ecology); the “Cork 2 Declaration” (on diversification in rural development); RISE (a European plan for more biodiversity friendly agriculture and food systems); ICLEI (Local Governments for Sustainability); SURFNATURE (a regional development funding for biodiversity); EFRD (a big regionb al development fund); NATURA 2000 (a big programme about biodiversity in cities); GI (all things Green Infrastructure); URBAN-RURAL LINKAGES (to do with rural cohesion); LAND-LIFE (land stewardship principles and tools); BiodivERsA ERA-NET (research on biodiversity and ecosystem services); EKLIPSE (upport mechanism for biodiversity); IPBES (“Science and Policy for People and Nature” ); GIAHS (Globally Important Agricultural Heritage Systems)’ ARC2020 (Seeding the Future of Rural Areas); or PEGASUS (“unlocking public ecosystem goods and servces from land management”). There are surely many more – and do tell me if I have missed any – but you get the picture. The Nature of Cities Urban Ecology Lab Cornell Civic Ecology Lab Biourbanism Biophilic Cities Cities Biodiversity Center and Biohabitats . La Ciudad Verde seems to be the biggest with 93,000 Twitter followers. Reconnecting with our bioregion is not about leaving home to live in a yurt. For most of us, it it means re-connecting with the land and biodiversity in the places where we live now – but in new ways. These can involve social farming, place-based development, and learning journeys. In a series of xskool workshops called #BackToTheLand2.0 we brought local actors together to ask: What are the key social-ecological systems in this place? What are the opportunities for this city-region? How night one design in them? We discovered that a rich diversity of city-rural connections is emerging. These include: Maker networks; grain and fiber ecosystems; outdoor and land-based learning; adventure tourism, sport science, mixed-reality gaming; ecological restoration; civic ecology; farmer-city connections; learning journeys: and the reinhabitation of abandoned of rural communities. We learned that myriad new ways for urban people to re-connect with the land are emerging: Ways that are part-time, but long-term; ways that involve an exchange of value, not just paying money; ways to share knowledge, land, and equipment in new ways; ways based on historical links between town and country – but reinvented in an age of networks and social innovation. 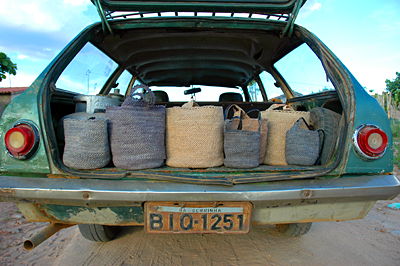 Designers and artists, we saw, can contribute to bioregional development in various ways. 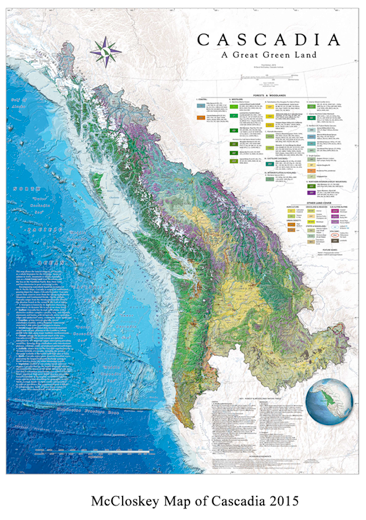 Maps of the bioregion’s ecological and social assets are needed: its geology and topography; its soils and watersheds; its agriculture and biodiversity. The collaborative monitoring of living systems needs to be designed – together with feedback channels. New service platforms are needed to help people to share resources of all kinds – from land, to time. Novel forms of governance must also be designed to enable collaboration among diverse groups of people. Another large topic, simply stated: What would a bioregion look like, and feel like, to its citizens, and visitors? One way to begin the journey could be a Doors of Perception Xskool. The outcomes of an xskool, typically, include a shared perception of new opportunities; new connections between motivated and effective people; and the determination to make something happen. This entry was posted in city & bioregion. Bookmark the permalink. Post a comment or leave a trackback: Trackback URL. Dear John, I’m leading a research project which is creating new metrics for bioregions. We have developed an approach which measures thremodynamic throughput rather than economic value. Would you be interested in discussing this? I am working with the Regenerative Communities Network and a legion of partner organizations to build learning ecosystems across a network of real-world regional collaboration projects. It is a joy to read and share your work across it. You may enjoy knowing that I have created a Reading List for Bioregional Design that includes several links to your writings. Please let me know if you have recommendations for other materials that I should share on it. 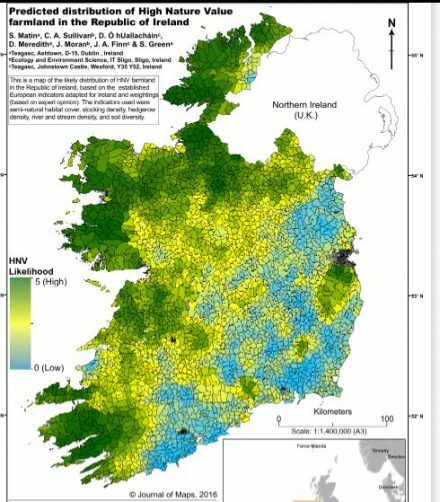 Great article and intro into bioregions. Thanks!